TB How did you get into the business of health care? TB Where have Apposite’s values come from? With everything we touch, as soon as we make a new investment we go into quality mode and we stay in quality mode. One of our flagship investment, Cancer Partners UK, is exactly what we did. It delivered the highest quality radiotherapy services which, if you compare it what is generally offered elsewhere, they were in a different ballpark. TB So you must go in and audit an organisation you want to work with. What are your benchmarks when you are looking at the quality of care? DP Our rule is that we want to outperform our very high-quality regulators, so staying with Cancer Partners UK, the CQC were more than satisfied with our protocols because the quality was so high. But CQC wasn’t our benchmark wanted to compare to the best international standard, so we asked a leading European radiotherapy hospital to come and audit Cancer PartnersUK’soperations. They gave us some recommendations but they also took some of our practices away. That’s the sort of thing we do. We get the real leaders in the field to come and say this is what you need to do to improve to be the best, not just the best in this area, but the best and that’s the way you can truly deliver quality. TB So that’s how you build leaders in the field? But how about individuals, what do you think makes a good leader? DP Three or four things. The first is commitment and that’s probably more important than everything else. You just have to want to do it. A good leader – and my leaders are entrepreneurs – will continue to do what they are doing and continue to increase their quality and adapt and change and get better constantly. They are never satisfied so it’s commitment to basically always being better than you were yesterday. If you get that in the CEO, everything else follows. I can think of one of the companies we invested in which was doing a couple of million of turnover and when we exited was turning over well over one hundred million. They achieved this in the space of about four or five years and the entrepreneur who was running it was a first-time CEO. If you keep going on quality, quality, quality, everybody raises their game every day. TB What is your highest value asset and give an example of it’s greatest success? DP I suppose the people that give me money to invest would measure it by the multiple that it made so that would be the company I just mentioned to you, where the return is~20x. TB What would you consider your greatest success personally? DP I would say my greatest success is my wife! TB Is there anything specific that you believe that everyone in health and social care should be working towards? DP It goes back to the quality agenda. There’s not really anything else to say. If you have that then everything else falls into place. If you don’t have that, it all goes pear-shaped. 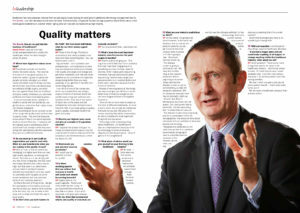 TB Do you think that commercial returns and quality of outcomes are mutually exclusive? DP I’ve answered that… absolutely not. TB What’s been the most important industry news for you over the past couple of months? DP There’s quite a lot going on. This might be a bit leftfield but I think probably the most important thing going on is something you may not have heard of. Illumina, which makes gene sequencing machines, has just announced a gene sequencing machine that will get your entire DNA sequenced for a hundred dollars and that’s really important because it is the future of medicine. Instead of worrying about all the diseases you may never get, you will have a much better idea of what you will get, so you can have targeted testing and targeted treatment. There will be no more need to weigh up the risks of different treatments, no more trial and error. You will get the medicines that work for you at the dose that suits you and the amount of money saved by that will be tremendous, so that’s probably the most significant thing that has happened. TB What piece of advice would you give yourself on your first day in the healthcare industry? DP Be bold! I think when we first started as Apposite, and even before that, we probably weren’t bold enough. Push the boat forward; achieve. TB What are your industry predictions for 2017? DP Unfortunately, it’s going to be slow movement in the same old direction. One is that we are going to slowly but surely get more into the 21st Century when it comes to IT, that’s going to help. But slower than we should do. The disease burden is going to continue to rise. We have this horrible thing at the moment when the NHS is beginning to do many things right,but the disease burden is just so overwhelming, that A&E will always be swamped, GPs will always be swamped and they’re running to catch up. It’s a bit like Alice in Wonderland, you know, the red queen…I’m running very fast to stand still – it’s the same thing.. The disease burden sadly is growing and it’s a combination of the old demographics story that everyone talks about combined with our addiction to food, alcohol and smoking. Resistance to antibiotics is not really here yet but it is a potential problem. Governments are going to have to subsidise the pharma industry because, at the moment, as you know, you only want to use the ultimate antibiotic for the ultimate bug. And that’s a small market, so why would big pharma spend million if not billion to discover something that has a too small market? Governments are going to have to do something to change that. Wild card question – from Paul Birley – If you had a magic wand and you could make anything at all happen or change anything within the healthcare industry, what would you do? DP Good question! There are so many things that need to be done in the healthcare industry, I don’t know where to start. If I could only do one, I would probably take IT into the 21st Century because it would have patient and cost saving benefits. We love it when you get a cost saving and a patient benefit at the same time – that’s what really turns us on! “We are more a healthcare company than a financial firm”. 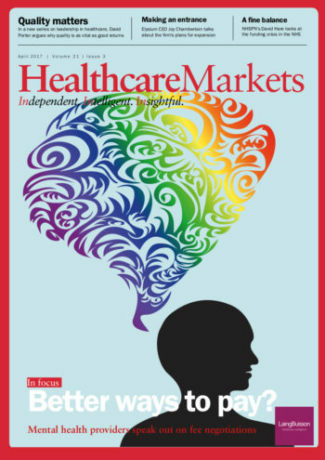 We meet David Porter at Apposite Capital to talk leadership – You can read our article in April’s Health Care Markets.